The introduction of the Regulatory Reform (Fire Safety) Order 2005 has brought together all the elements of fire safety. It is vital that emergency lighting comes on if the normal lighting fails. It needs to be sufficiently bright, illuminated for enough time, and the light sources so positioned that the occupants of a building can be evacuated safely in an emergency. BS 5266 Emergency Lighting, the Code of Practice for the emergency lighting of premises, offers guidance on the positioning of emergency luminaires, minimum height levels and acceptable glare levels, together with minimum routine testing schedules. 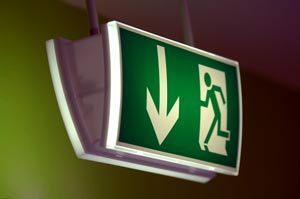 BS 5266 puts additional emphasis on the importance of regular testing of emergency lighting equipment. We offer fully documented risk assessment services for businesses, enabling demonstrable compliance with the Regulatory Reform (Fire Safety) Order 2005. Call us on 020-8397 2161 or email info@reedme.org.uk for further information.